An online retailer has produced a report that claims 2K Australia is working on a so-called "pre-sequel" in the Borderlands series for Xbox 360 and PS3, bridging the five year gap between the first game and Borderlands 2. What's more, the report seems to think that it'll take place on Pandora's moon of Elpis. The retailer in question, namely GamePointsNow also says that the Borderlands pre-sequel will also feature four new characters, called Athena The Gladiator, Wilhelm The Enforcer, Nisha The Lawbringer and Fragtrap, who take orders from a programmer known only as 'John'. It's thought that John eventually becomes Borderlands 2's antagonist, Handsome Jack. 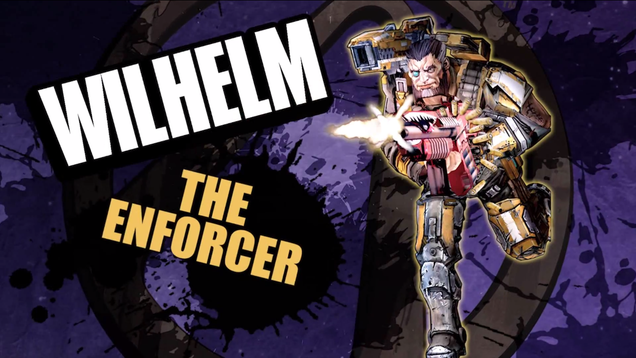 Borderlands fans will know Wilhelm as an early boss in Borderlands 2, and in the pre-sequel, he'll apparently be armed with shoulder-mounted cannons and drones. 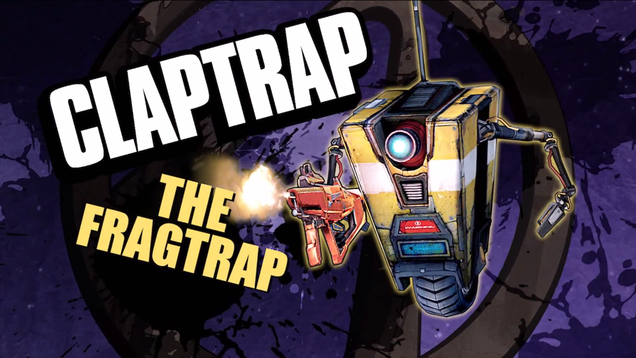 Athena featured in Borderlands' Armory of General Knoxx DLC, and will have Zer0-style melee attacks, while Fragtrap is a modified Claptrap unit, armed with weaponry. 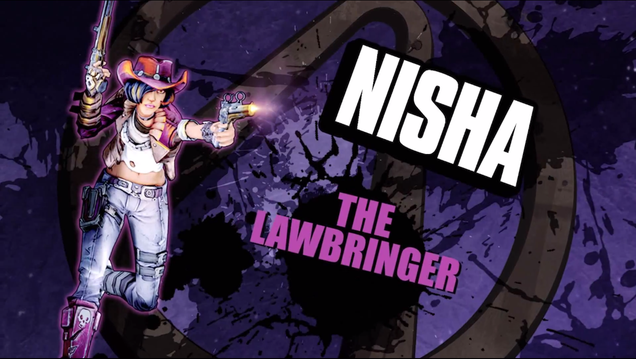 It's thought that Nisha could be related in some way to the Sheriff of Lynchwood from Borderlands 2. Two new classes of weapon are also mooted, with lasers and enemy-freezing cryo guns mentioned, while low gravity on the moon will enable you to shoot bandits into orbit, float around with a jetpack and loot 'OX-kits' to top up your oxygen supplies. The story reportedly revolves around the new band of misfits searching for a mysterious alien artifact. Of course, this is all rumour for the time being, as nothing has been confirmed by 2K. If this purported Borderlands pre-sequel transpires to be a real thing, it'd be the perfect way to set up a proper Borderlands title on Xbox One and PS4. It all sounds remarkably plausible. Still, we'll wait for something official before getting too excited. As much as I'd like to see the Borderlands world expanded on, I wonder what the motivations would be to hand an established franchise like this over (if this rumor turns out to be true) to a studio that's mostly known for having inconsistencies in terms of structure and their role within 2k. 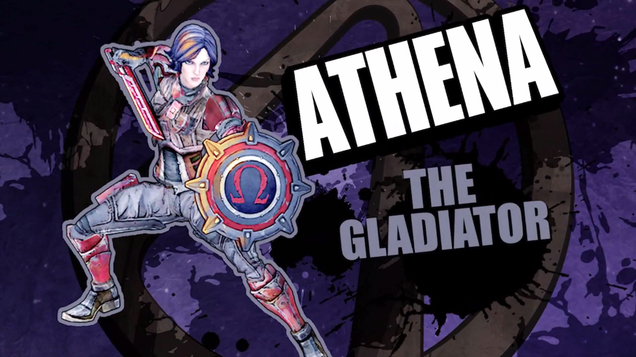 Her action skill is called "Kinetic Aspis," which basically translates to a shield that can absorb damage and then can be thrown at enemies with the full force of the damage it absorbed. There are a few choice skill tree attributes that really amp the shield up in different ways—extra damage, healing and tanking attributes, and one skill that let's the shield strike several enemies before it returns to you. He's the big robot boss from Borderlands 2, except he wasn't always a robot. He's a human like any other in The Pre-Sequel. Except, as you level him up, his abilities will slowly construct that robotic form he eventually turns into. Another Borderlands 2 character who we knew as the Sheriff of Lynchwood. Details are scarce at this point. orth noting that the camera view will be considerably lower than that of the other characters', but Gearbox's Pitchford assured us that his other abilities more than make up for that. Still plowing my way through borderlands 2. 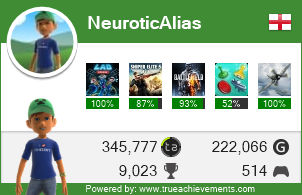 Not picked it up for a few weeks but must get back into it as I have some dlc still to complete. Then I'll probably play 1 as I havnt touched that yet! I know,playing it arse about face but that's me! Thinking back on it, Borderlands 2 and the first are kind of a mixed bag for me. The humor is great in both games, but there's definitely a palpable difference. Borderlands 2 is definitely a step up in terms of story and characters and has some really nice improvements and additions like The BadAss Rankings/Challenges. The DLC's are totally flipped for me though. The first Borderlands' DLC feels a lot more like a game hitting its stride and the BL2 DLC feels more re-hashed and slightly un-inspired, save for Tiny Tina's DLC which actually worked on a more psychological level, in terms of dealing with the topic of death. Ever wondered if your favorite researcher, Sir Hammerlock, had a sibling? Well he does, and she’s the older sister that every little brother is terrified of. Lady Aurelia the Baroness is the newest playable character coming to Borderlands: The Pre-Sequel as a downloadable add-on. 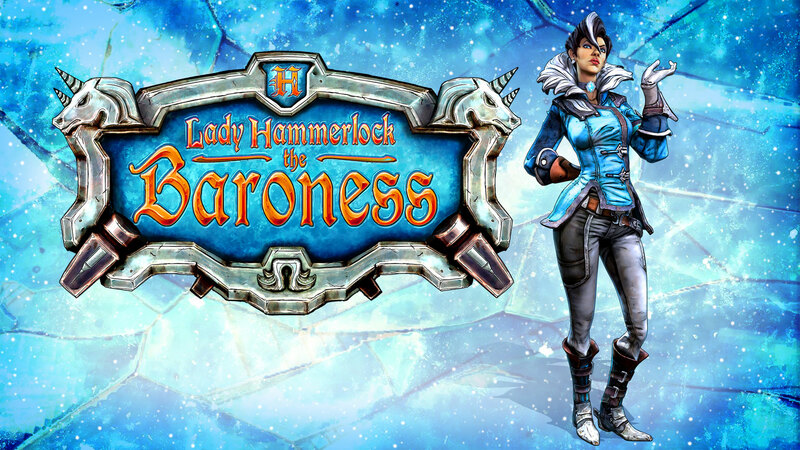 Starting on January 27, 2015, you’ll be able to pick up the Lady Hammerlock Pack on PlayStation 3, Xbox 360, and Steam. Aurelia is the heir of the Hammerlock family fortune, but when she's not riding her hoverbike through the endless hallways of her orbital turbomansion, she's out hunting the latest and greatest game in the galaxy. If these expeditions should put her in conflict with her younger brother Alistair – aka Sir Hammerlock – all the better. The only thing more fun than shooting a rare animal Alistair intended to study is the look of abject horror and surprise on his face once Aurelia wears its carcass like a jaunty scarf. Normally, Lady Hammerlock would never be seen within a light year of Pandora, but she's grown bored as her turbomansion grows cold, while her lust for violence grows hot. She's headed to Elpis with nothing more than an expensive gun, an experimental Cryo diadem, and a powerful belief that shooting angry things in the face is a good deal of fun. 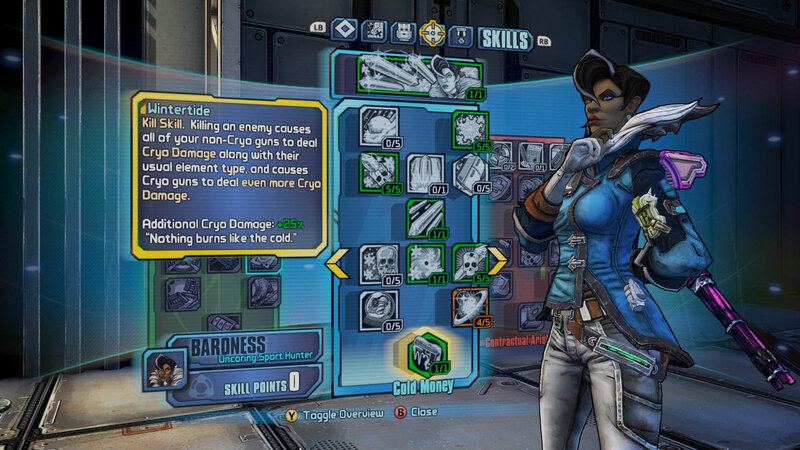 Like every playable character in Borderlands, Aurelia has an action skill and three different skill trees. Her action skill is Cold As Ice, which lets her throw out a Frost Diadem Shard that seeks out enemies and attaches to them, dealing constant damage. If that target dies, the shard will move onto a new enemy, and so on. Her three skills trees are Huntress, Cold Money, and Contractual Aristocracy. Her Huntress skill tree focuses on sniping, including a skill that offers a massive critical hit bonus for each consecutive hit she lands without missing. Her other skill tree, Cold Money, focuses on ice damage and includes a skill that can add Cryo damage to any gun. Her third skill tree is Contractual Aristocracy, which allows her to turn a co-op teammate into a servant, earning her bonuses for their kills in addition to her own. We’ll have much more info on just how badass Aurelia is in the weeks ahead, so keep an eye out for a deep dive on her skills. If you’ve already picked up the Borderlands: The Pre-Sequel Season Pass, the Lady Hammerlock Pack is included, but for players that haven’t, the pack will also be sold on its own for $9.99. The Borderlands: The Pre-Sequel Season Pass is available for $29.99 and grants access to all four add-on content packs – a $39.96 value! – as they become available on Xbox Live, PSN, Windows PC, Mac, and Linux. While each add-on content pack will be available for sale individually, the Season Pass offers all four packs for just about the price of three! The Season Pass also includes the previously-released Handsome Jack Doppelganger Pack, which makes Borderlands 2’s maniacal antagonist playable for the first time (or at least someone who looks an awful lot like him), as well as the Ultimate Vault Hunter Upgrade Pack: The Holodome Onslaught, which raises the level cap to 60 while offering a new challenge arena with new enemies, new weapons, new class mods, and new customization options. Since Borderlands: The Pre-Sequel launched on October 14th 2014, the teams at Gearbox and 2K Australia have continued to work hard on supporting the game with post-launch content, with more to come. The fourth and final add-on pack in the Borderlands: The Pre-Sequel Season Pass will set players off on a brand new campaign set inside the mind of Claptrap. It may be one of the weirdest things in the Borderlands universe to date, so stay tuned for updates as development progresses! *Coming to Europe and Asia on January 28, 2015.